Anything that throws doubt on the reliability of the Afghan National Army always represents a big problem for Nato. The fact is, just as has been happening in Iraq, the key to getting British, US and other troops out is to be able to say that the Afghan army is now big enough and strong enough to take over full responsibility for their nation's security. The deaths of three British soldiers at the hands of a renegade Afghan soldier in Nahr-e Saraj, Helmand province, on Tuesday, though clearly a rare event, does not help the army's reputation for reliability. Nor does it create greater confidence for the British, American and other Western troops who work alongside Afghan soldiers, training them. Nevertheless, although the Taliban have predictably claimed the rogue soldier as one of their own, these incidents have so far been rare enough not to create an ever-present anxiety for the Western troops working with the Afghans. Most Western soldiers seem to enjoy the experience of training Afghans, and usually find them quick to learn and reliable. But the incident is a reminder of the damning report on the army and police that was issued last month by an American government agency, the office of the Special Inspector-General for Afghan Reconstruction. The report revealed widespread absenteeism, corruption and drug abuse among the Afghan forces. 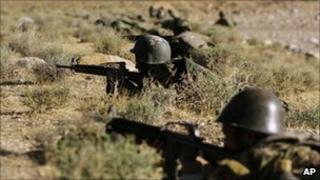 It suggested that only 23% of Afghan soldiers and 12% of police were capable of working unsupervised. In March, it found, 17% of the police and 12% of the Army had been absent without leave. Nevertheless, it is a frequent failing of Western organisations to measure developing countries in terms of their own institutions. By comparison with the Taliban - the only comparison that matters - the Afghan army is quite an effective organisation. It is certainly a good deal better than it was under the Russians. And after the Russians left, in 1989, the Afghan army of the time fought off the combined forces of the Afghan resistance, the mujahideen, for three long years. Almost certainly, even when the main Western forces have left, sizeable numbers of British and American special forces will remain to give strength to the Afghan army. Incidents like this do not help the public perception in Western countries of the war. And it is public opinion, rather than the plans of the politicians and the generals, which will determine the speed at which a Nato withdrawal can happen. The generals know that the Afghan army will not be up to the necessary level in terms of numbers and training until around 2014. But that will be well after the next US presidential election, in 2012, and uncomfortably close to the next British election in 2015. Both President Barack Obama and British Prime Minister David Cameron will need to see results in good time before their respective deadlines. The man who is in charge of the military end-game in Afghanistan, General David Petraeus, will clearly use some of the tactics that enabled him to extract the United States from its quagmire in Iraq. He is already planning to use local, irregular forces to help fight the Taliban. They provide a basic platform of resistance, which will make things difficult for the insurgents, though it is hard to know if they will represent a long-term proposition as a fighting force. It is still too early to be certain what Gen Petraeus's full strategy will be. It will be very hard to replicate the effects of the surge in Iraq that enabled him to reduce the level of bombings and killings there. Still, the full exit strategy in Afghanistan will presumably involve a big effort to create a sense that Nato forces have the upper hand. Anything short of that might well be interpreted in Afghanistan and around the world as a defeat, rather along the lines of the Soviet withdrawal 21 years ago. Having US Rangers and British SAS men fighting alongside the Afghans is not a recipe for stopping the Taliban, but it may well give Nato enough respite to pull out in good order. After that, presumably, the long Afghan civil war which has gone on since the 1970s will simply continue. And one of the poorest countries on earth will be left to its fate.